Describe the advantages of insulated metal roofing panels for roofing as an all-in-one air, vapor, and water barrier solution, along with the continuous insulation requirements mandated by many codes. Compare the benefits of IMP roofing to common roofing alternatives. Identify the growing importance of a high-performing building enclosure and how IMPs support this goal. Discuss a number of best practices for the optimized design and installation of IMP roofing systems. As an all-in-one air, vapor, and water barrier with continuous thermal insulation, insulated metal panels (IMPs) for roofing are an ideal way to meet today’s increasingly stringent building codes. The prefabricated units, when installed correctly, can contribute significantly to the building enclosure’s thermal performance levels, while simultaneously enabling fast-tracked construction and lower field labor costs. 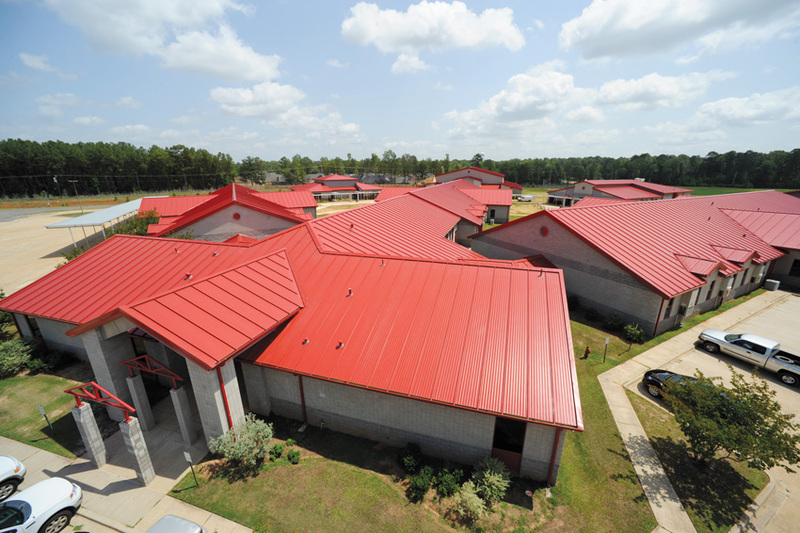 Made from rigid foam injected into two sheets of metal, Phil Kazba, FCSI, CCS, AIA, SpecGuy Specifications Consultants, Mount Dora, Florida, describes IMP roof and wall systems as providing the closest-to-perfect solution for uniform temperature, moisture, air, and water vapor control. 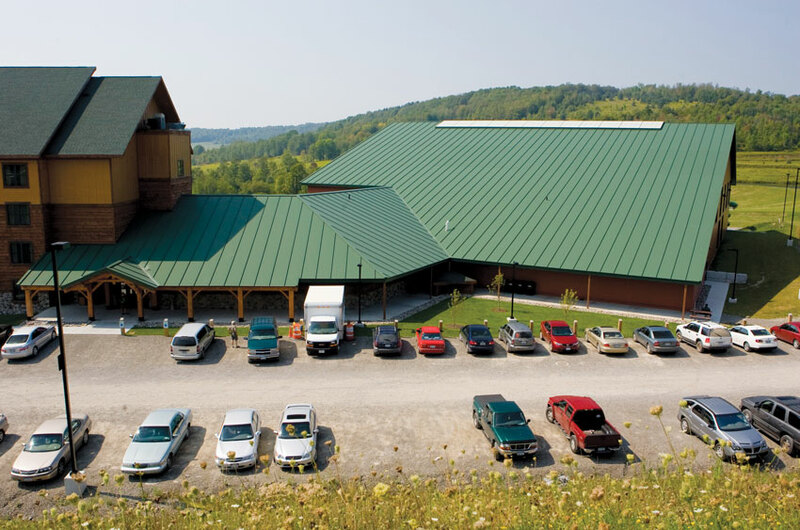 The Hope Lake complex, pictured here in Cortland, New York, used standing seam insulated metal roofing panels as a perfect all-in-one air, vapor, water, and thermal solution to cover an indoor water amusement park with high moisture in the air. Originally developed for large industrial facilities requiring space conditioning, growing interest in continuous insulation performance, partially driven by the codes, has helped propel IMPs into the architectural realm, making it a suitable choice for arenas, schools, office buildings, fire stations, transportation hubs, and airport facilities. “The panels are relatively lightweight, installation and erection is relatively fast, and the panels function as a structural deck, insulation, and finish system all-in-one package that can span over supports/purlins,” reports Richard S. Koziol, AIA, NCARB, principal, Wiss, Janney, Elstner Associates Inc., Northbrook, Illinois. The Windy City architect also sees IMP roofing systems as best suited for steel-frame buildings having a minimum roof pitch of 1:12 and steeper, and for roof geometries that are simple and straightforward. And because the panels are attached by a simple pre-engineered combination of clips, fasteners, and substrate, they are not subject to failures resulting in incompatibility amongst components, moisture within the system, application temperatures, or similar failure modes present in membrane roofing, according to Kazba. “Virtually maintenance-free, IMPs are subject to very occasional inspection to verify substrate movement or improper fastening have not led to joint or flashing displacement,” he adds. In comparing IMPs to other roofing alternatives—namely built-up roof membranes, EPDM (ethylene propylene diene terpolymer) rubber roofing, and modified bitumen (modbit)—IMPs offer a number of advantages. For starters, the above-mentioned roofing materials either have an adhesive or the plys must be touch applied, thereby creating an unpleasant odor, which can be disruptive when retrofitting an existing operating building. Even more serious, torch-applied modbit is known to cause leaking and moisture infiltration in cases where the moisture barrier is improperly installed, says Sam Williamson, co-founder, KBHomeSpecialists, Glasgow, Scotland. While built-up systems offer a high level of waterproofing, they come along with higher installation costs, a slower installation schedule, and are more susceptible to wind and water damage. Of course, another significant factor is a noted difference in life expectancy. Whereas built-up, modbit and EPDM will last between 15 and 20 years, metal roofing offers more than 40 years with little maintenance. Once modbit and EPDM start to fail, the insulation begins absorbing moisture, at which point the materials have little to no insulation value. In fact, IMPs really stand out when it comes to insulation, lending higher R-values per inch, as compared to the alternatives. Take a standard thermal transmission test, at an average 75 degrees Fahrenheit, for example. The R-value of a 2-inch IMP clocks in at 14.28, at 4 inches the R-value is 28.6, and a 6-inch IMP has an R-value of 42.9. To compare, a 3.5-inch layer of fiberglass insulation registers an R-value of 11, and 6 inches offers an R-value of 19. Another disadvantage with fiberglass is the R-value becomes compromised when compressed. This inconsistency in the fiberglass thickness, coupled with an added requirement for manual labor to secure it to the frame, leaves a noted margin of error. Furthermore, fiberglass insulation has a facing on the interior side, which is vulnerable to damage when exposed to a building’s interior. Conversely, IMPs have an advanced polyurethane core sandwiched between two metal skins, capable of delivering a consistent, long-term R-value. When properly installed and sealed, the insulation becomes encapsulated by metal trim, effectively creating an impermeable membrane around the panel. By injecting a polyurethane core into two metal facings, the insulation is encapsulated by metal trim, which creates an impermeable membrane around the panel, thereby protecting the insulation. When considering an IMP roof, an important factor is the fact that it is capable of supporting a high-performing building enclosure, which has evolved into a sought-after building feature in recent years. “The amount of energy, and consequently heat, that is lost through poorly insulated roof and walls is staggering. Building owners have no problem getting heat into their facilities, but keeping it there is another matter entirely,” notes Williamson. Offering energy savings between 20 percent and 40 percent, particularly in climates with extreme cold or heat, properly sealing the envelope has become a big focus for today’s buildings. Recognizing the criticality of the building enclosure, the U.S. Army Corps of Engineers actually requires its buildings to undergo whole building air leakage testing, in addition to meeting ASHRAE’s 90.1 standard for a tight building enclosure. While somewhat less aggressive, the International Energy Conservation Code (IECC) has also jumped on the bandwagon, requiring air tightness levels at 25 percent less than ASHRAE 90.1. Based upon the U.S. Department of Energy’s latest Status of Energy Code Adoption map earlier this year, 25 states have adopted some form of the 2012/2015 IECC air leakage standard, which permits air leakage compliance through either the air tightness of the individual components or through the continuity of the entire air barrier assembly, as verified through a whole building air leakage test. To achieve proper air and water infiltration for the IMP system, a proper seal system is critical. 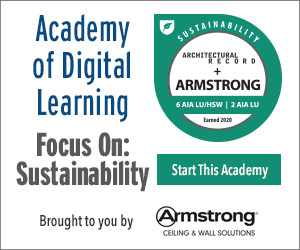 “When the panels are properly installed with continuous seals at panel joints and proper roof-to-wall transitions, the effective air leakage rate is reduced to near ASHRAE’s tight building standard of 0.10cfm/sf of air leakage at a pressure differential of 75 Pa,” he adds. A key detail for achieving a thermally efficient building enclosure is having the insulation on a continuous plane with minimal joints and seams to prevent thermal bridges where insulation can escape, explains Koziol. Because IMP roof systems typically have a single-layer plane of insulation with a sealed side and end joints or laps for moisture resistance, as well as thermal efficiency, they are a very good option for energy savings. Putting things into perspective, IMPs offer close to three times the insulation efficiency as a field assembled glass fiber system, according to the Glenview, Illinois-based Metal Construction Association (MCA). As delineated in MCA’s Selection Guide for Insulated Metal Panels (available as a free download at www.metalconstruction.org/download.php/education/downloads/user_file_5), to achieve an R-value of 20 with an IMP, only a 23/4-inch to 3-inch thickness is required, whereas the same R-20 with glass fiber—along with a separate liner, sub girt, and fascia—will require an approximate 71/2-inch-thick roof or wall system. The guide also points out that IMP thermal performance is enhanced because there is no metal conductance from exterior to interior skin. “The materials used on the roof have a huge impact on how energy efficient it is, and IMPs are easily one of the best choices,” confirms Williamson. 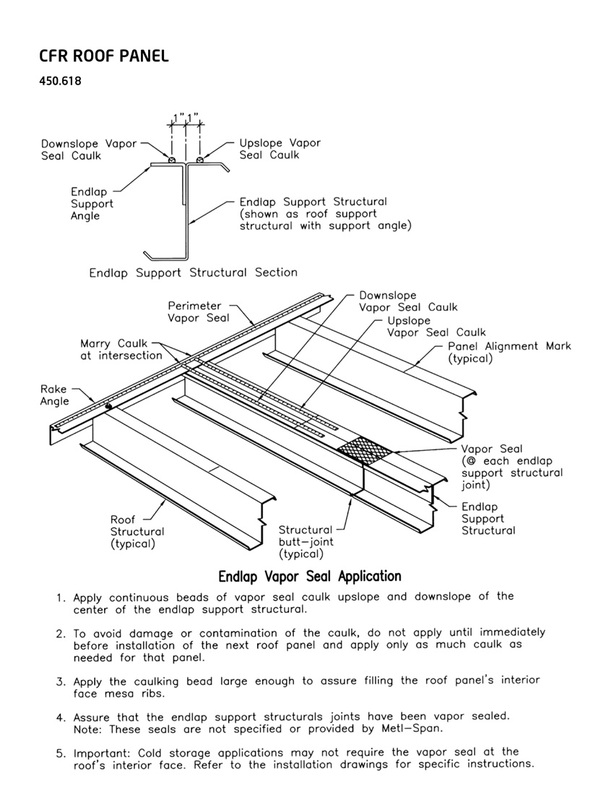 The proper allocation of vapor barrier sealant is essential for a proper endlap installation. Of course, this is assuming the IMP system is properly detailed and installed. Along these lines, penetrations through the roof should be kept to a minimum because flashing them for long-term durability and water tightness can be challenging, according to Koziol. Of course, the key to certifying a high-performance enclosure is ensuring that the air, water, vapor, and thermal systems are all in place, which is where the major benefits of IMPs really shine with their all-in-one solution. In terms of better understanding how all these components work within the IMP membrane, Joseph Lstiburek, Ph.D., P.E., principal, Building Science Corporation, Westford, Massachusetts, explains that a typical IMP roof provides air, water, and vapor control above the thermal control layer, which prevents rain, air, and vapor from entering into the assembly from the outside. A membrane below the insulation keeps the air and vapor from penetrating the assembly from the inside. This approach works in all climate zones and in all interior environments. However, for this to all work properly, there must be continuity between the walls, roofs, and slabs, which means that the roof to wall—and wall to foundation, for that matter— must connect to the control, air, vapor, and thermal layers. Lstiburek also notes that prefabbed IMP roofs contain the same control layers as site-built roofing systems. This includes the exterior surface controlling water, air, and vapor; the interior surface controlling air and vapor; and drying occurring to both the exterior and interior.